SO!! I watched into the woods today and it gave me some idea&apos;s! Behold! The after math of me watching a movie. Everyone&apos;s heard of the story of red riding hood and the wolf right? The little girl innocently going to visit her grand mother when along comes the big bad wolf. But what if the story was told more differently that one would expect...? "Can you also bring these to granny dearest?" Mother asked me kindly, her wrinkles showing evidently more significantly while she smiled. I nodded a small smile plastered on my face while she placed some cookies in my basket,"and remember!-" I cut her off rolling my eyes while I nodded,"don&apos;t stray too far from the the path! I know I know..." I smiled innocently. She sighed and flicked my head while I giggled, I stepped back at skipped along the path to the woods, while behind me she waved. My white hood trailing after me while the wind blew on my face, giving me sweet cold kisses, I smelled the fresh air of pine wood and oak. The crunch of my hoods against the dead sands of leaves. I smiled as I slowly entered my woods, beginning to walk rather than skip. I gripped my basket tightly in excitement, granny was sick and mother had sent me off to deliver her some sweets to cheer her up. I admired the beautiful scenery of the trees swaying from side to side, following the wind, the sound of slow crackling of winds crashing on each other. The wind rustling through the leaves, the sun slipping through the cracks and hitting my face. This was why I live for the woods, the sound of birds chirping and wind brushing through my hair, I lived for it all. I spun around arms open wide, i must of looked ludicrous, but those things didn&apos;t matter not in the woods. But then, everything stopped, when out of the shadows came a boy, a boy so strange words could barely describe. Brown rough hair that was sticking in all sorts of places, golden eyes gleaming, tan fair skin, a brown top that was smothered in dirt and dark brown pants that was held up by a thin rope. But the strange description had yet to come, for he had a brown tail behind him that was wagging uncontrollably, and brown wolf ears that were perked up. The girl stopped and stared at the strange boy, he was on all fours wearing a large grin on his face. The girl stumbled back in surprise, he baked goods sprawled on the floor, her basket out of hands reach. She felt the weight shifting on the grass and soft patter of bare feet on dirt as he slowly crept up to her, still wearing his toothy sharp grin. Once he was hovering over the girl he started to sniff her hair, she stood deadly still mouth hung open as wide as can be. Wide eyes stared back at golden ones, he jumped off her and began to jump in joy,"HI! My names eren, and you are...?" He asked helping the astonished girl up. She pulled her hair off her shoulders and stared once more at the boy, coming closer she peered into his eyes. 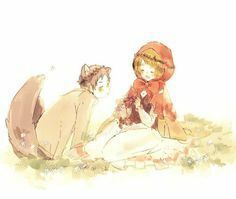 The boy had a faint tint of red on his cheeks before she backed away and narrowed her eyes at him pulling on his tail and ears. Once they were confirmed real she crossed her arms and began to think, the boys question still lingering in the air. "I&apos;m... Um- Y/N..." She said scratching her chin in thought if that was a good idea to tell him.